Bridge Breast of Baylor is literally a lifesaver, as in MINE. 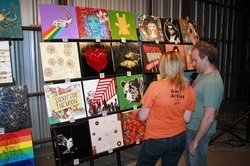 1. bring together dallas area artists&musicians to raise money for a chosen benefit. 2. to provide art to the non-gallery attending masses. Click to Directly Donate to CF Foundation! ​Tenison Women's Health Care Center, INC.
a blog packed with family-friendly recipes and lighthearted stories about motherhood. She’s constantly inspired by her amazing husband and daughter and her large floppy eared dog, Jack. Her fresh whole food recipes have been published in many print and on-line publications and currently is an Ambassador for California Raisins. Meredith can be found at Gojee.com, and is a writer for Applegate Farms. The Greatest Generation aka "The Depression Children"..fewer every day. Interiorscape design&maintenance services, beautiful foliage at reasonable prices w/variety of containers to compliment any decor. Seasonal color program for blooming flowers inside all year round. Great personal customer service, beautiful orchids &variety of tropical plants~!